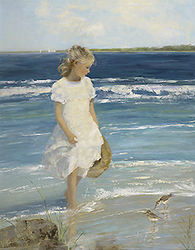 At the age of seven her family moved to Greenwich, Connecticut where they spent long periods in the country and at various seaside locations. She remained in Greenwich most of her life, relocating just within the last decade. Most summer days were spent at Todd's Point on Long Island Sound, playing in tidal pools, chasing minnows, collecting shells and exploring. The entire family shared a passion for the beaches, sunshine, and fresh air. While spending time with Frank in New York, her desire to become an artist grew and she search of further training which would complement and enhance her previous studies. This same year, 1969, she entered the Art Students League of New York, taking the train in every day to attend classes. 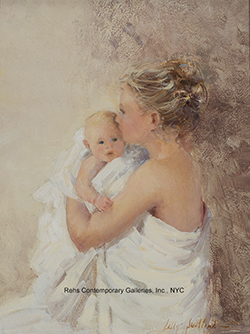 There she studied formal figure and portrait drawing and painting for six years under the direction of Robert Schulz - an illustrator who continued Norman Rockwell's tradition and became famous for his illustrations that graced the covers of many Zane Gray books. Schulz used a thoroughly academic approach to his painting that was based on the Frank Reilly method – Reilly was an illustrator and highly regarded teacher who worked during the fifties and sixties. Each of the students first perfected their drawing techniques before progressing to monochromatic wash-ins, or what is also referred to as grisaille. This method allowed students to establish the drawing values and planes before adding color. The Reilly method was a structured and disciplined way of teaching which allowed the student to gauge progress and reach their goals. During the summer months Schulz also held numerous plein-air landscape-painting classes in the New Jersey countryside where Sally would drive long distances to attend. These classes taught her to observe nature and how atmosphere affects objects and color. Continually inspired by her surroundings, these studies were integral to the formation of her choice themes and subjects. One sunny summer afternoon, while relaxing with her mother at Todd's Point, Sally decided to snap some photos of children playing in the puddles, capturing the relationship between them and how they played. Sally describes it, “The beach is a perfect place to capture children and their relationships because they are carefree, intense, and happy. I spent many days and years on the beach, I have visual memories of the water, sand, and atmosphere.” Since she was unable to paint at that moment, but she took the time to absorb her surroundings, memorizing and studying the water, sand, reflections, and the atmosphere. At home she used these photos and her experiences to execute a small painting and showed it to friends who liked the feeling of the painting. She had found her subject, one that equally had a personal meaning and a freshness of atmosphere. 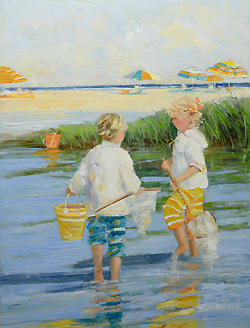 Clearly, Sally had found her subjects and an audience for them - views of children playing on the beach or in a lush garden, one that had a personal meaning and a freshness of atmosphere. 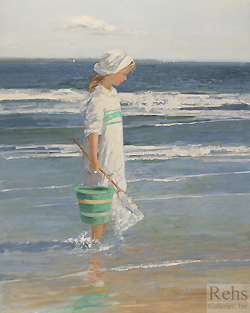 Her favorite images were of children playing in tidal pools, yielding light filled and colorful reflections. As her children grew older – her second daughter Katie was born in 1981 – the family traveled to discover other beaches. They spent a good deal of time on the West Coast exploring the coastal communities of California from Newport Beach to Laguna down to Del Mar. On the East Coast, they enjoyed the beaches of Maine down the North Shore of Massachusetts and over to Cape Cod. The beaches became an important and inspirational part of their family life. For much of the 1980s, Sally concentrated on her family, spending a great deal of time with her children. 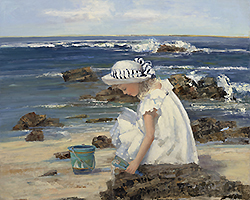 She continued with her portrait commissions and dabbled in capturing her young models playing on the beaches and gardens they visited. Her camera continued to be an important recorder for her paintings. She spent many summer days at the beaches and gardens around Greenwich where she would take her daughters and their friends and photograph them. She would capture children on film in all types of beach and garden activities. There was a significant amount of bribery that went on between Sally and her children so that they would cooperate in what she now calls her 'beach dress up photo archives'. The children knew it was a way to acquire further summer treats and gain extra benefits - it was all quite amusing to Sally. Her success and images continued to proliferate. In 1986 she had a chance meeting with the owners of Caspari - a greeting card company located in New York. This turned into a job and over the next 14 years she created more than 150 original designs that were used on numerous greeting cards. She kept very busy creating these compositions and through numerous personal and professional contacts was becoming a much sought after portrait painter. 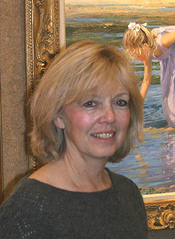 Sally has exhibited with a number of national organizations including Oil Painters of America, Catharine Lorillard Wolfe Art Club, Hudson Valley Art Association, and the American Society of Marine Artists. At the 11th Annual Marine Art Exhibit at the Coos Art Museum her painting Newport Surf won an Award of Merit and was runner up for the People’s Choice Award. At the Cape Cod Art Association’s Open Juried Spring Exhibition Todd’s Point received the Second Award and at their 2004 New England Exhibition Noelle was awarded the Second Prize in Oil. At the Catharine Lorillard Wolfe Art Club's 108th Annual Open Exhibition, Todd's Point was again singled out and awarded the Gold Medal of Honor.